It goes without saying that ceiling fans are a pleasant addition to any room. But what makes this particular item such a desirable commodity? The answer may seem obvious, but when examined a little more closely there are many factors that lead to the vast popularity of ceiling fans. The ceiling fan was first invented in the late 19th century, as a solution to the extreme humidity in many areas. Fans were originally belt driven, two-paddled objects and were run not by electricity but by water power. It wasn’t long until they were improved upon and eventually became the ceiling fans that are produced today. A ceiling fan can make the difference between a stifling room and one that feels enjoyable. Ceiling fans, though they don’t create cooler air, will aid in the climate control of a room. Generally there is a button on the side of the fan motor that sets the fan either in a clockwise or counterclockwise direction. In the summer months the fan should be set in the counterclockwise direction which will move the breeze from the fan in the downward direction, working with the body’s natural cooling mechanism as the air hits the skin. The winter setting on a ceiling fan is in the clockwise position. The air from the room is drawn upwards, forcing the warmer air that is near the ceiling downward making the room more comfortable without the chill that would result if the fan were left on the summer setting. Many fans have a remote control with a reverse button, making it much easier to change the setting. Most ceiling fans have the capability of lighting a room, either by the choice of an added light kit, or integrated lighting. The type of lighting can range from incandescent to fluorescent and LED. The biggest advantage of a ceiling fan is the energy savings benefit of using a fan in conjunction with air conditioning. 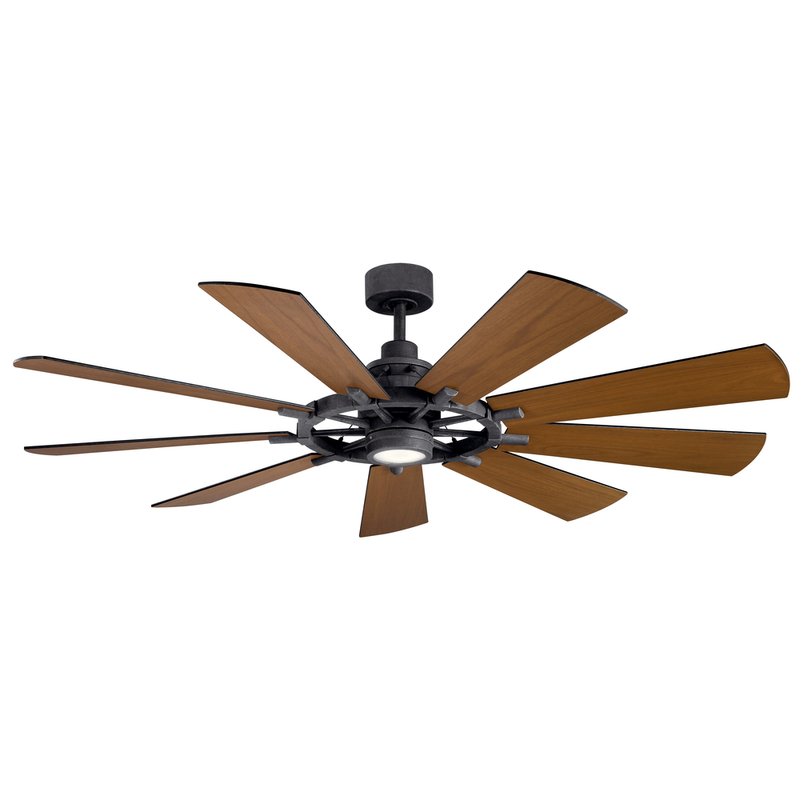 A ceiling fan uses about the same amount of energy as a 100 watt light bulb. With the aid of ceiling fans, an air conditioning unit can be set at a lower temperature, thus saving energy. This is where the reverse settings on the ceiling fan help the most, circulating the otherwise still air and keeping the room comfortable. Not only are ceiling fans practical, they are also a designer statement. They are made in so many styles with rich finishes and attractive blades made from many different materials. A ceiling fan can set the tone for an entire space, not only providing comfort, but light and beauty as well.